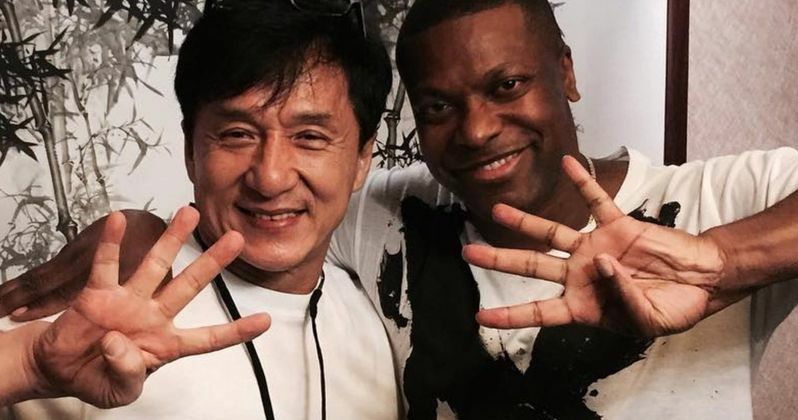 Is Rush Hour 4 finally getting ready to happen for real? The studio is remaining quiet on the matter and we haven't heard anything official on their end for some time. That said, we know that the franchise's stars, Chris Tucker and Jackie Chan, are both very interested in doing it and have been actively trying to get it up and running. Now, thanks to a recent social media post from Tucker, there is some renewed hope. That is, if we allow for a little speculation and reading into things. Jackie Chan recently celebrated his birthday. The legend of martial arts and the silver screen turned 65 and he has been showing absolutely no signs of slowing down in recent years. He's spry and keeping busy. Chris Tucker shared a photo of the two posed together, a recent one at that, and they both look rather thrilled to be there. At first glance, it appears to just be a post made for a friend on his birthday. Tucker had this to say in his caption. "Today is Jackie's birthday. I want to wish my boy Jackie Chan a Happy Birthday!!" However, in a second photo immediatly following the first birthday post, there contains a not-so-subtle hint of things to come. Both of them are seen blatantly holding up four fingers, which isn't really a hand gesture known to indicate anything in a general sense. Therefore, one can draw a conclusion that this is a deliberate tease for the long-awaited Rush Hour sequel. The question is, just how far off is it? And is this just a tease in the true sense of the word, more hopeful on their part as well? Or is something truly coming? We've been hearing about this project for some time. On the big screen, the franchise has been dormant since 2007. There was the TV series in 2016, which aired for just one season on CBS, but it's clear that people weren't very into it. We first started hearing that a fourth movie was actually gaining steam in 2017, but it's failed to actually materialize. Chris Tucker, on a podcast in February, explained that they're still working on the script and trying to get everything together, though he seemed encouraged and enthusiastic. The three Rush Hour movies, released between 1998 and 2007, grossed a combined $849 million at the box office. As it stands, no director has officially been attached to the proposed fourth installment. We did recently hear that STX was looking to possibly make a female-led Rush Hour movie starring Bingbing Li (The Meg). That doesn't necessarily mean that Rush Hour 4 wouldn't happen as well. The two things could easily co-exist. For now, we await some sort of official announcement, but this is intriguing. We'll be sure to keep you posted as any additional details on the project are made available. Be sure to check out the post from Chris Tucker's Instagram below.